When the smoke cleared from what officials said may have been a terrorist attack, dozens of victims lay in the street, some unconscious, some grievously injured, including some whose limbs had been torn off by the blast. At a news conference this evening, Richard DesLauriers, head of the Boston office of the FBI, said the FBI was taking the lead in the probe of the blasts. “It is a criminal investigation that is a potential terrorist investigation,” he said. “It was just immediately [evident] there were injuries, right in the middle of the spectator crowds,” said boston.com sports producer Steve Silva, who was on the scene to cover the race, normally a spectacle that is a magnet for elite athletes and determined runners from across the world. “There was blood everywhere; there were victims being carried out on stretchers. I saw someone lose their leg. People are crying. People are confused,” Silva, who captured one of the explosions on video, said moments after the blasts. The injured were brought for treatment to eight area hospitals. Massachusetts General Hospital treated 29 people, 8 of whom are in critical condition, Dr. Peter Fagenholz, a trauma surgeon, told reporters at a briefing late this evening. He said “several” people had to have limbs amputated. Dr. Ron Walls, chair of emergency medicine at Brigham and Women’s Hospital, said at a separate briefing that his hospital had treated 31 patients. “We will turn every rock over to find the people who were responsible for this,” Boston Police Commissioner Edward F. Davis said. Neither Davis nor DesLauriers would discuss any specifics of the case. The Federal Aviation Administration said it had implemented a no-fly zone around an area of Boston at the request of law enforcement officials and temporarily stopped planes on the ground at Logan International Airport to change the runway configuration. Davis said the attacks had occurred without warning. “There was no specific intelligence” suggesting an attack would take place, he said. Governor Patrick said there was a “horrific attack here in Boston” and authorities were focusing on making sure the area around the Copley Square finish line was safe and secure. He urged everyone to stay away from the area. Davis had initially said there had been a third explosion at the John F. Kennedy Library in Dorchester. But he downplayed those comments at an afternoon news conference, suggesting that the incident might not have been an explosion and might have been a fire. 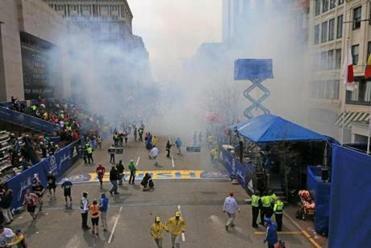 Davis, the police commissioner, said the two explosions had happened near the finish line 50 to 100 yards apart. Obama said he had directed the full resources of the federal government to “investigate and respond” to the blasts and that he had assured Governor Patrick and Mayor Thomas M. Menino that “every single federal resource necessary” was available to them. Davis said many people who fled the scene on Boylston Street left bags and parcels strewn along the route, and each of those items was being “treated as a suspicious device” and might be detonated by authorities. The blasts came long after the elite runners had finished the race — at a time when hundreds of amateurs were crossing the finish line. About 27,000 people were slated to participate in the race. Governor Patrick said it was not yet clear how businesses in the cordoned-off area would be affected, but said workers “in most cases” will probably not have access to their offices Tuesday morning. Davis said authorities were continuing to comb through bags left behind at the scene of the blasts but as yet, no additional explosive devices had been found. “I’m not prepared to say that we are at ease,” Davis added, however. “No piece of information or detail is too small,” the FBI said in a statement. Jim O’Sullivan, Andrea Estes, Maria Cramer, Brian Ballou, Michael Levenson, Travis Andersen, Kay Lazar, and Carolyn Johnson of the Globe staff, as well as Globe correspondents Todd Feathers and Lauren Dezenski contributed to this report.